Home #Hwoodtimes Greetings form the Land of Enchantment! Greetings form the Land of Enchantment! Santa Fe, NM (The Hollywood Times) 2/4/19 – As part of the Santa Fe Film Festival Ed Asner will be presented with the Lifetime Achievement Award on Saturday February 16th at 7:00 PM at the Scottish Rite Temple, Santa Fe, NM. 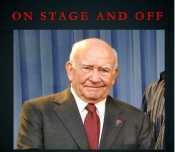 Edward Asner is widely acknowledged as the most honored performer in American television history (seven Emmy’s, five Golden Globes) and is a spokesman for progressive American ideals. Join actress Robyn Reede to discuss his inspirations and influences, his remarkable acting career, his brave political activism at personal cost and his unflagging energy to this day as a superb performer on screen and stage. This 2-time former president of the Screen Actors Guild (1981-85) is as devoutly serious about the craft of acting as he is about sticking to ethical action in public life. Don’s miss this unique opportunity. Robyn Reede and her guest in front of the SFIFF banner. Also showing as part of the Santa Fe Film Festival will be the documentary – “Ed Asner: On Screen and Off” February 16th @ 1:30 PM@ the Jean Cocteau Cinema as well a screening of “The Parting Glass” on February 17th at 12:00 at the Jean Cocteau Cinema. Don’t miss all the other great films and panels showing during The Santa Fe Film Festival February 13th – 17th, 2019. It’s a great time to come visit Santa Fe! The Santa Fe Film Festival celebrates all facets of cinematic arts – here in New Mexico, regionally and globally. Our annual event honors everyone working both behind the scenes and on screen to bring the best of film creation, production and showings to the public. We constantly seek improvement in our respective crafts and provide film makers with resources to pursue their dreams. To that end, the Santa Fe Film Festival focuses on bringing together distinguished industry specialists and discriminating movie lovers through accessible screenings, panels, workshops, ceremonies and celebration.